The Gorkha Janmukti Morcha yesterday desperately tried to nullify the advantage that the hill Trinamul had received from Mamata Banerjee's announcement that a land survey would be conducted for residents of Mirik municipality. Roshan Giri, the general secretary of the Morcha, yesterday said: "The announcement is good as it is our own people who will get land rights. However, we have apprehensions that it might just be a political stunt before civic elections. Survey of Mirik municipality area was done in 2011 by the Left Front government and if the government is sincere, it should immediately distribute land rights." Giri yesterday raised another point. "The government is presently distributing land rights among people in the plains but the ceiling is five decimals. However, people of Mirik have land more than that ceiling. The government must give deeds for the entire land that is under a resident's possession and there should be no salami," said Giri. 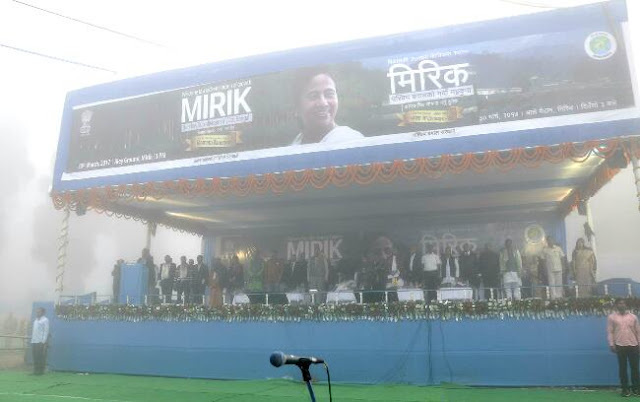 The Trinamul (hills) tried to cash in on Mamata's announcement yesterday and said the party was a bridge between the hill people and the government. Khawash said the government was fully committed to solving problems of the hill people. "The government has recently sanctioned Rs 3.66 crore to Darjeeling municipality to erect street lights after people approached us and told us about their problem. In addition to this, the government has also give a go-ahead to civil works in Darjeeling municipality which will be undertaken at an estimated cost of around Rs 3.5 crore," said Khawash.